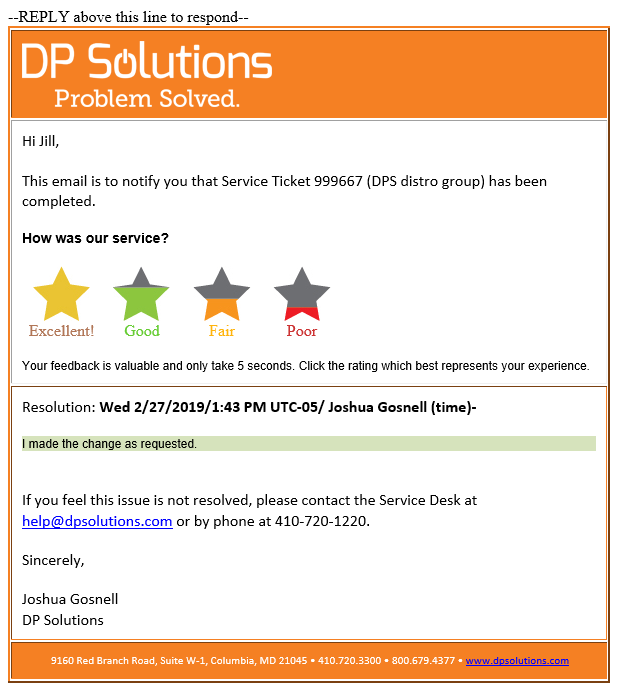 In order to obtain real-time feedback from clients, DP Solutions includes one-click satisfaction surveys with each Service Ticket that we complete. This gives you a QUICK and EASY way to provide immediate feedback on the service that you receive. By collecting important feedback, we are better able to serve you and resolve challenges faster and more effectively. When a Service Ticket is marked as complete, you (or whoever submitted the ticket) receive an email letting you know that the ticket has been closed. The email contains one question, "How was our service," along with four clickable stars to rate your experience. Any survey that is not rated "Excellent" is quickly followed up with by your Account Manager to understand why that rating was given and identify areas for improvement. Additionally, our Client Experience Manager, and the manager of the team member responsible for the completion of the ticket, investigate so that any issues are addressed immediately. Below is a sample of what a closed ticket email looks like. You'll notice that the the stars to rank the service are located right at the top of the email. When you click a star, you are taken to a landing page where you can submit additional feedback if you choose. Whether you leave comments or not, key team members are notified of your response, follow-up actions are taken if necessary, and your response is automatically logged into our ticketing system. Click the wrong star? Don't worry! Just resubmit your survey and only the most recent submission will be noted. As a Confidence Plus client, you will receive reports on the status of all customer satisfaction ticket surveys in the form of monthly Executive Summary Reports. We can also pull reports for you at any time and for any given time frame... all you have to do is ask! Your feedback is key to our continued success and partnership! We are always trying to improve and provide a better client experience. We highly encourage you to provide feedback on our service as it will only help us serve you better. Want to know more about being a Confidence Plus client? See our Confidence Plus FAQ's.